Can you handle the truth? We’re back again for another Home Truths Melbourne roll of the dice on Saturday 9th April 2011, taking the temperature (ahem) of the local auction market and culture around property sales and buying. 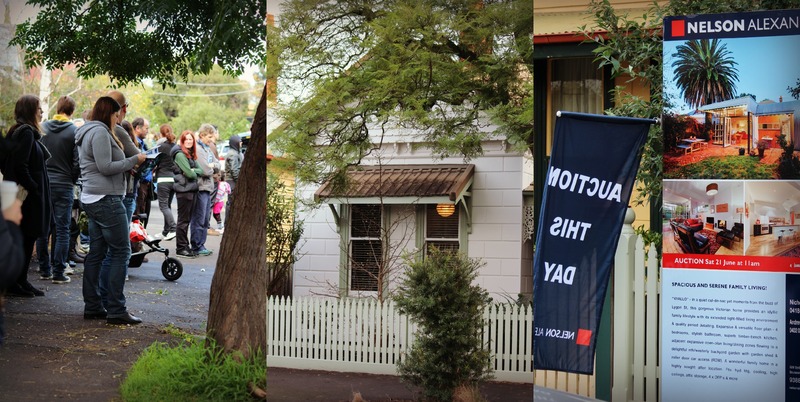 This week we have a diverse range of auctions, from a State Trustees number in Carlton North through to a tri-level townhouse in the depths of Brunswick. 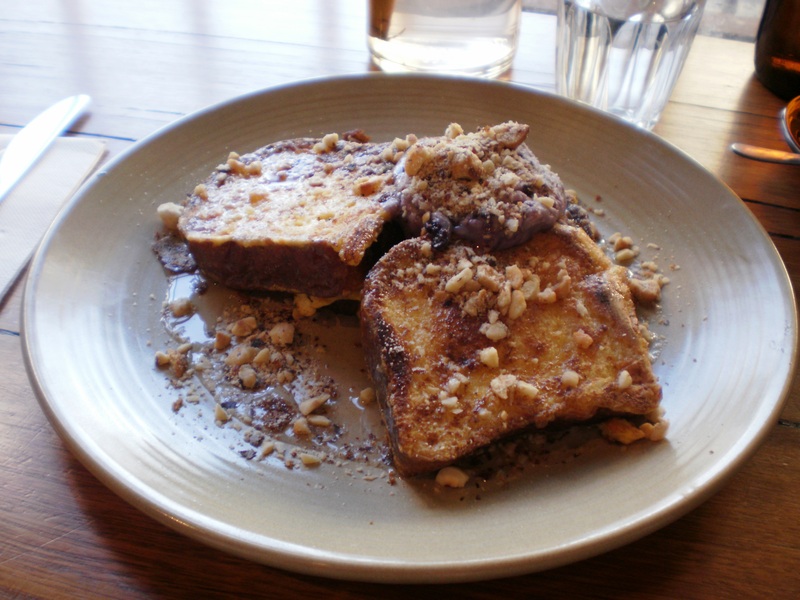 You voted for this week’s breakfast review (choices were Proud Mary, Birdman Eating and Cavallero), and we enjoyed a suitably delicious repast at Cavallero. We also enjoyed the company of Melbourne Property Manager extraordinaire Vicki Lekanis today, who answered our ‘One Hot Minute, My Breakfast’s Getting Cold’ questions about leasing and renting. 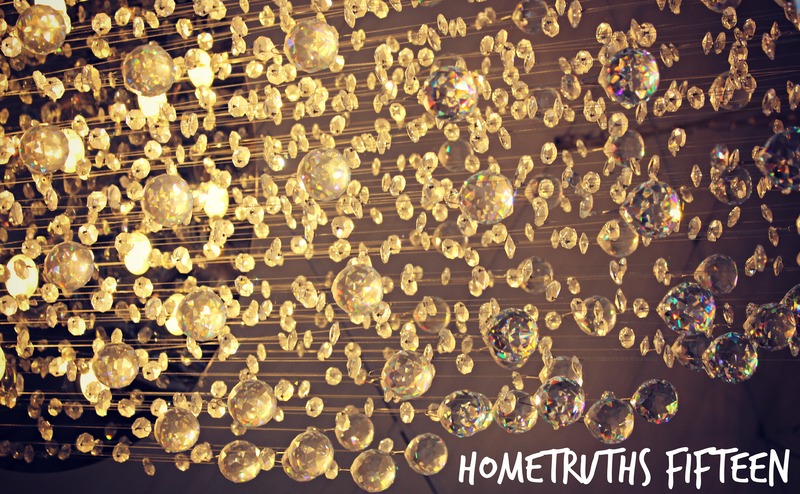 Here’s this week’s Home Truths Melbourne. Vibe: Enjoying the cool Tasmanian-style sunshine on a blustery Saturday. Sans Spirit of Tasmania heaving. 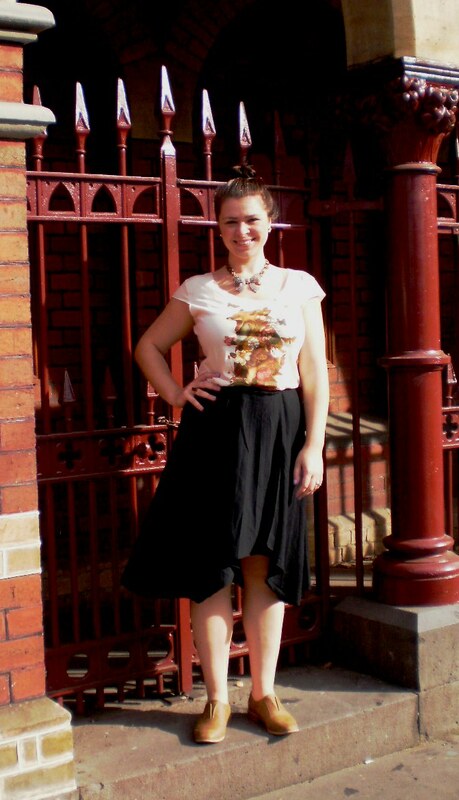 Wearing: Scanlan & Theodore Skirt, Threadless T-Shirt, Rubi Shoes, Tilkah necklace. 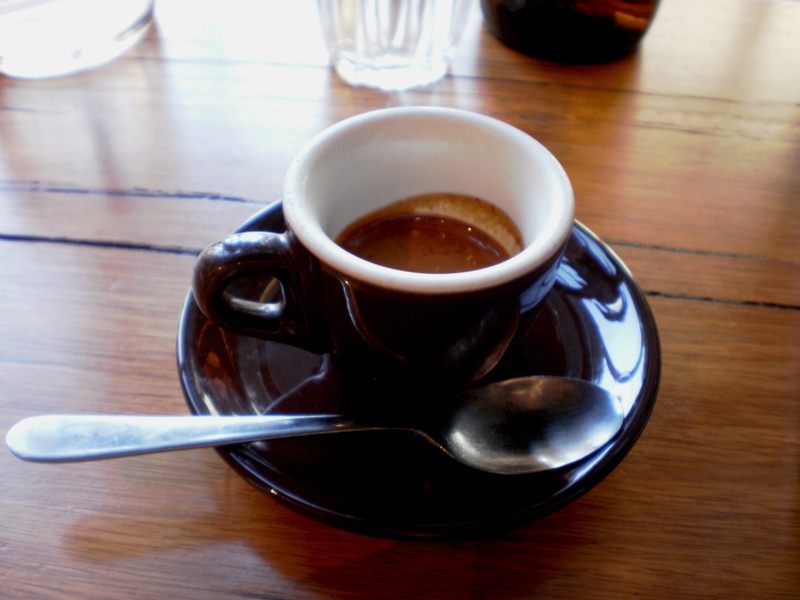 First stop of the day – Cavallero, 300 Smith Street in Collingwood. 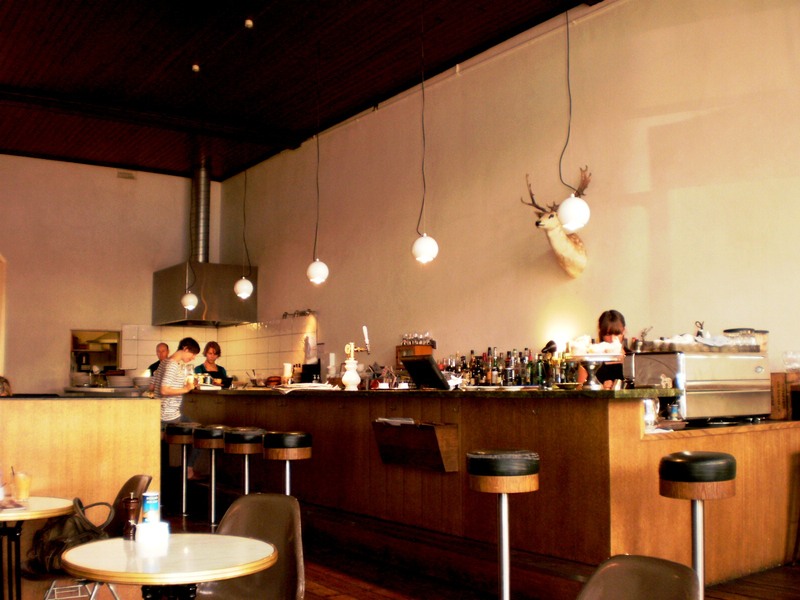 I was so happy that you crazy Home Truths Melbourne kids chose Cavallero for our breakfast review, as I hadn’t been and the vaulted high ceilings and elegant ironwork front doors had been a-callin’ for quite some time. Plus, I was meeting my good friend and property manager extraordinaire Vicki Lekanis for the first of our Saturday morning ‘One Hot Minute, My Breakfast’s Getting Cold’ interviews. Double happiness. 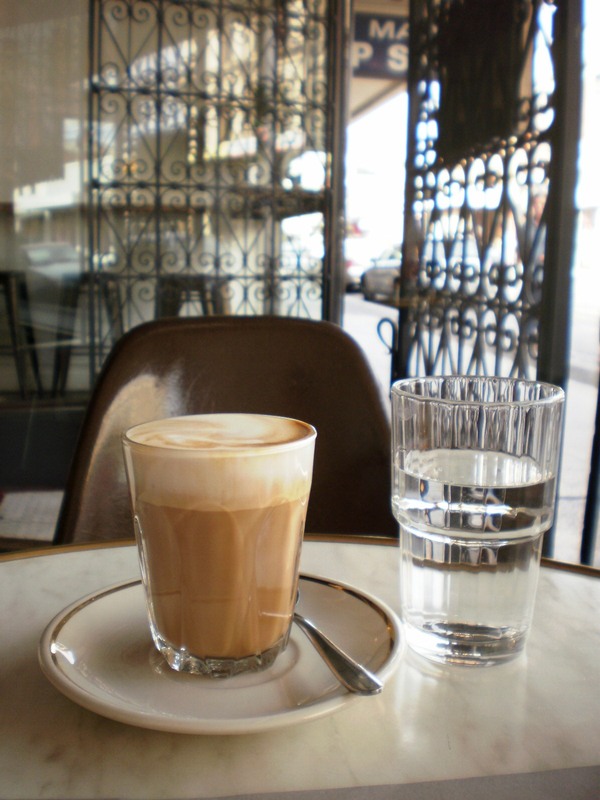 When I arrived at Cavallero I swiftly found a seat in the front window and was offered a coffee – the soy latte came quickly. Nice dramatic iron door, huh? The soy latte was nutty and suitably strong…. 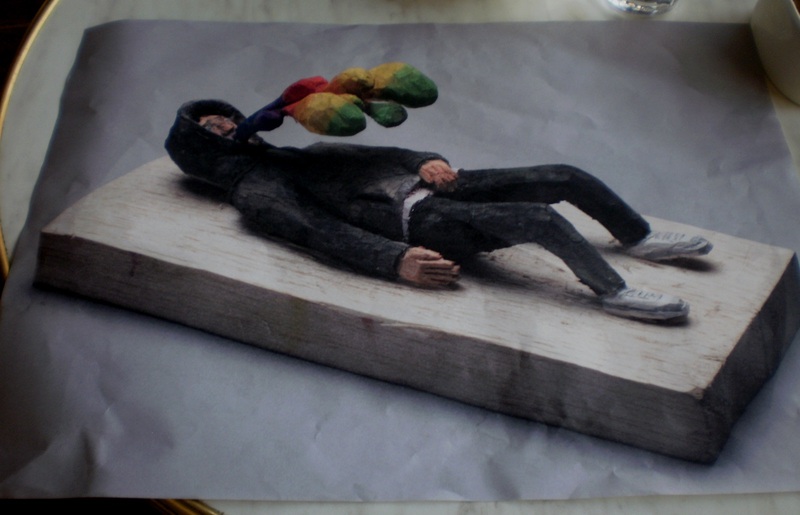 giving me inspiration to peruse the extensive menu with artwork by Toby Pola on the back (below). It was sweet sailing for me though, with not a rainbow vomit in sight! The interior of Cavallero is elegant, with beautiful airy mahogany ceilings, plush padded booths and an outdoor courtyard. 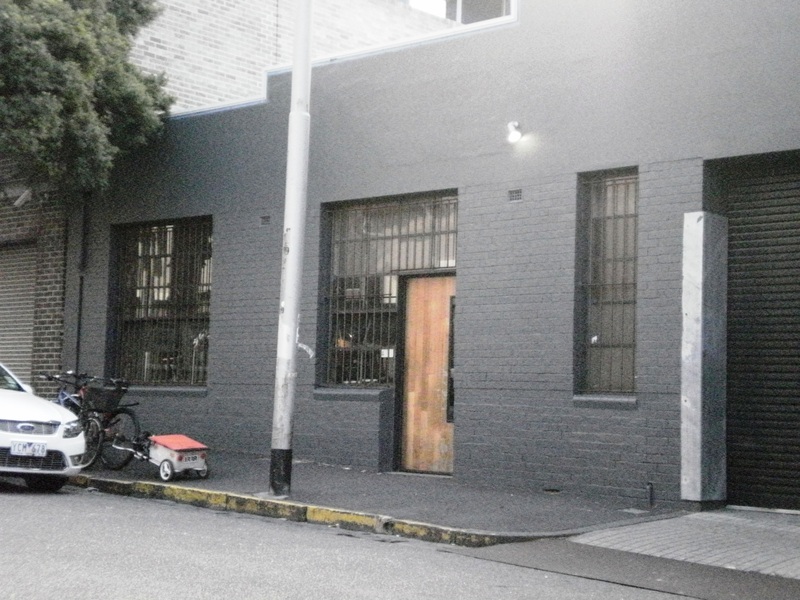 It is somewhat at odds with its central location on Smith Street (near Woolies and Gluttony) – it feels like Cavallero would be more at home on Gertrude Street which has become slightly more gentrified. However, it was full of fashionable young types which shows that a cultural change along main Smith Street is inexorably occurring. Vicki and I ordered without ado, especially enjoying the Wind in the Willows quotes on the menu – a charming touch. 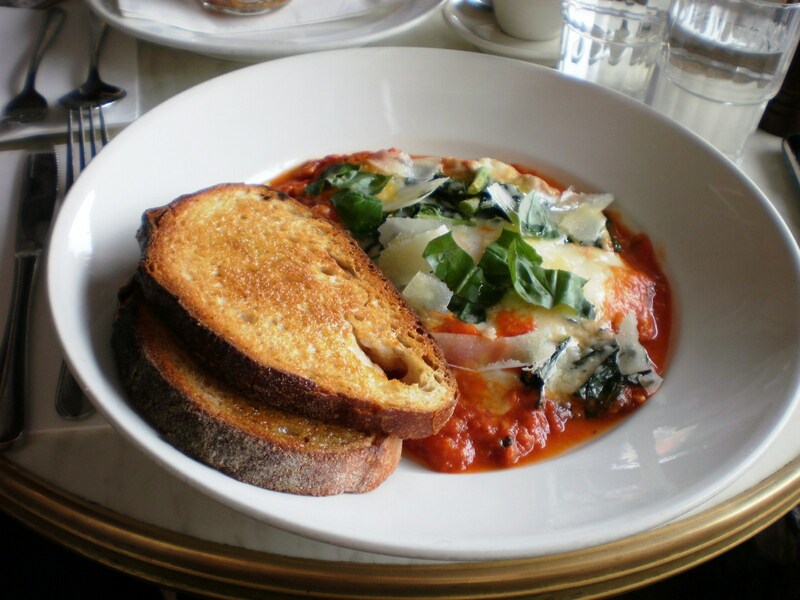 Check out these bad boys – baked eggs in a tomato sugo with fontina cheese, cavolo nero and sourdough bread. 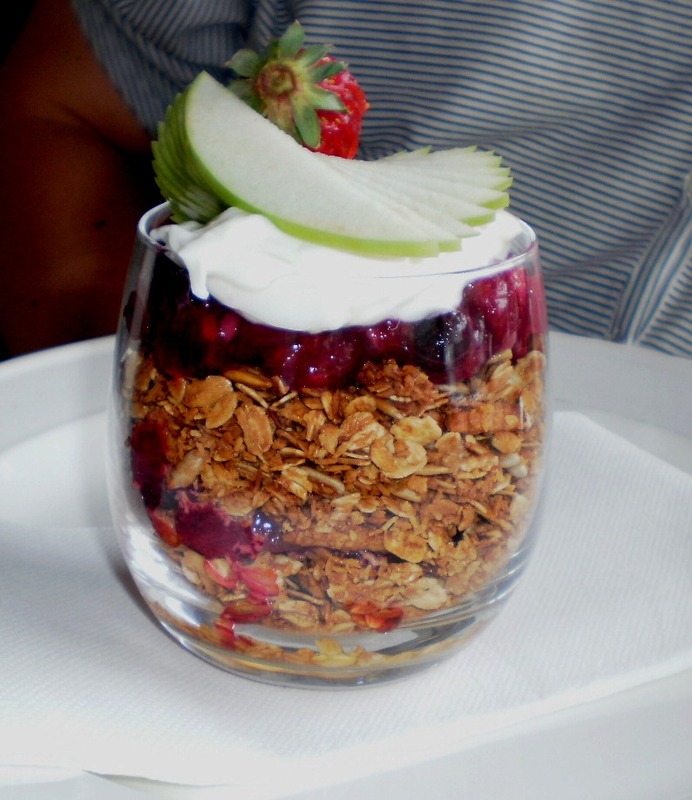 Breakfast trifled with granola, yogurt and poached fruit. Winner! 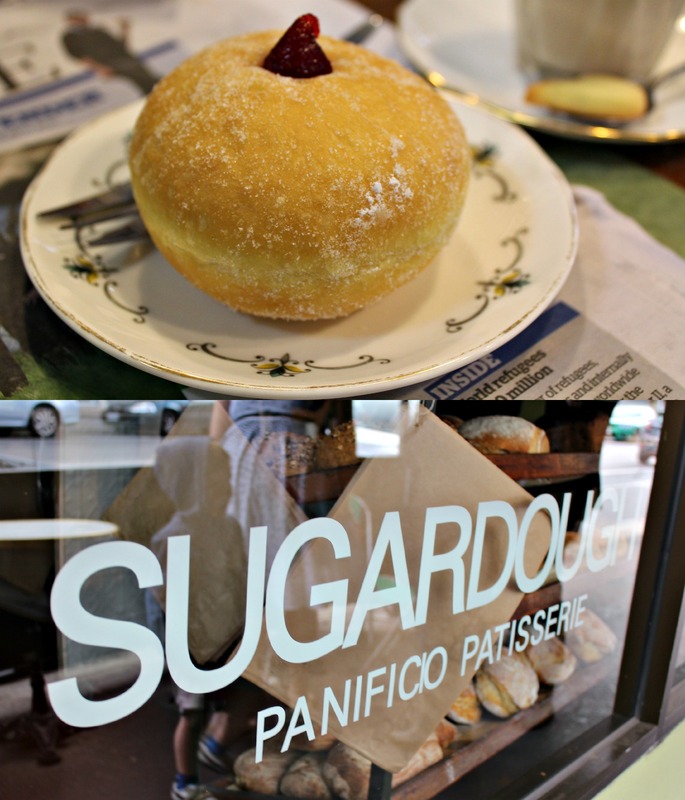 Whilst nomming our way through these Cavallero treats ( Home Truths gives Cavallero a big thumbs up, go there before you start your next hunt for homes in Collingwood or East Melbourne! ), Vicki and I got down to an interview focussing on her expertise in property management. 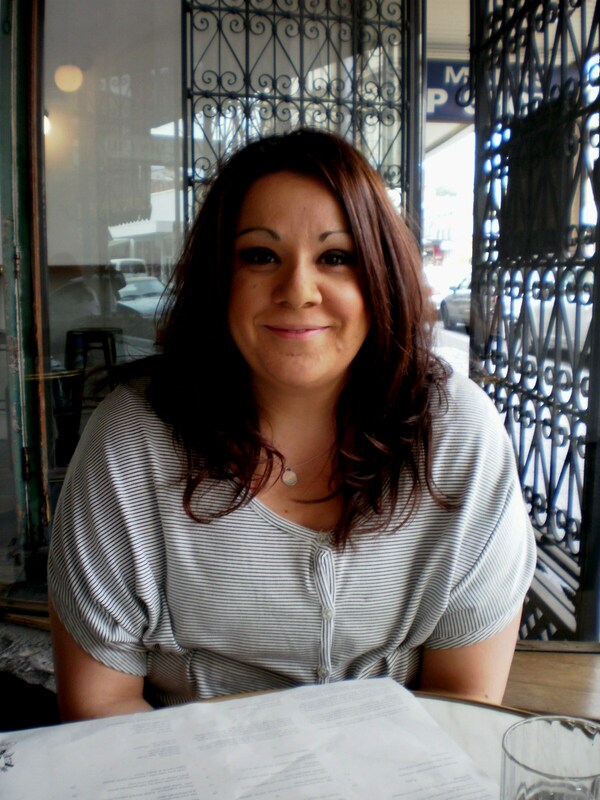 Vicki is the Senior Property Manager for Caine Real Estate, with nearly a decade of experience in managing premium property in Melbourne’s blue chip neighbourhoods. Here are her words of wisdom. What is the biggest mistake tenants make in the leasing process? The biggest mistake is looking at too many properties and taking too long to apply. In many cases they might have seen a terrific place on a Friday, which will be leased by the time they get back to us with an application. Speed is important in application! Also, make sure to read texts of advertised properties carefully. Don’t assume that pool and gym amenities are part of the lease, nor the furniture depicted in advertising – clarify these points with your leasing agent. The best approach to leasing a property is to make a shortlist of five things your home must have, and focus on those items first in making your decision. 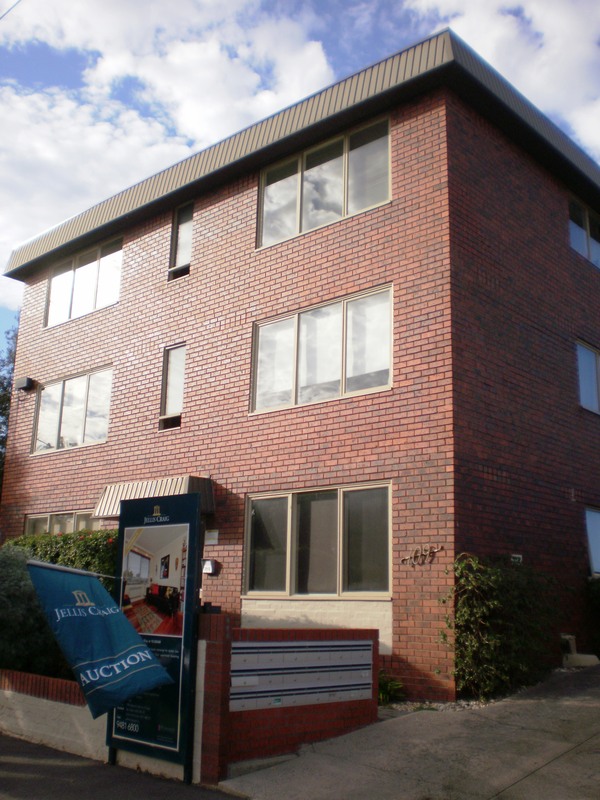 What is the biggest mistake landlords make in the leasing process? I’d have to say the biggest mistake landlords make is choosing an agent based on their fee rather than their skill. I have clients that might be happy with my service but will want to argue over fees that might ultimately amount to the price of a coffee a week. Choose an agent that is relevant to the area, has a track record in their business, has a great team with suitably systems and processes in place and ask to see examples of their work – condition reports, routine inspections etc. There are lots of agents that will just do a ‘tick and flick’ form which doesn’t stand up in tribunals – a thorough agent will always make detailed notes for their landlords. 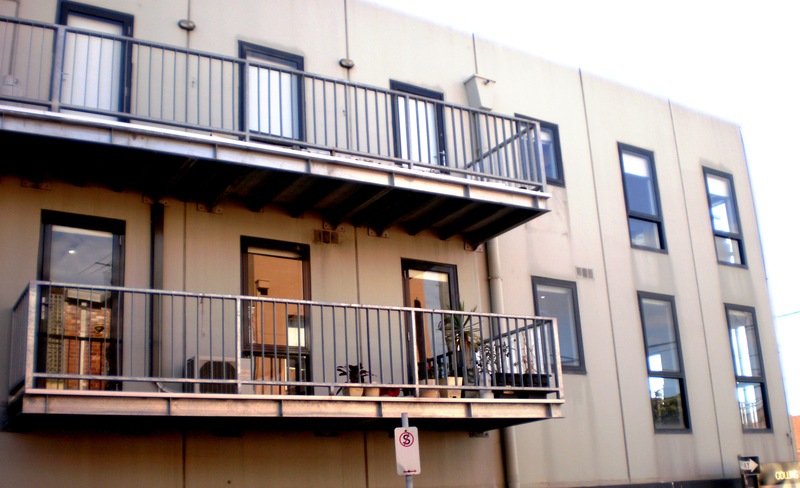 Ultimately you will get what you pay for in property management services. Are open for inspections on Saturdays necessary for property management? 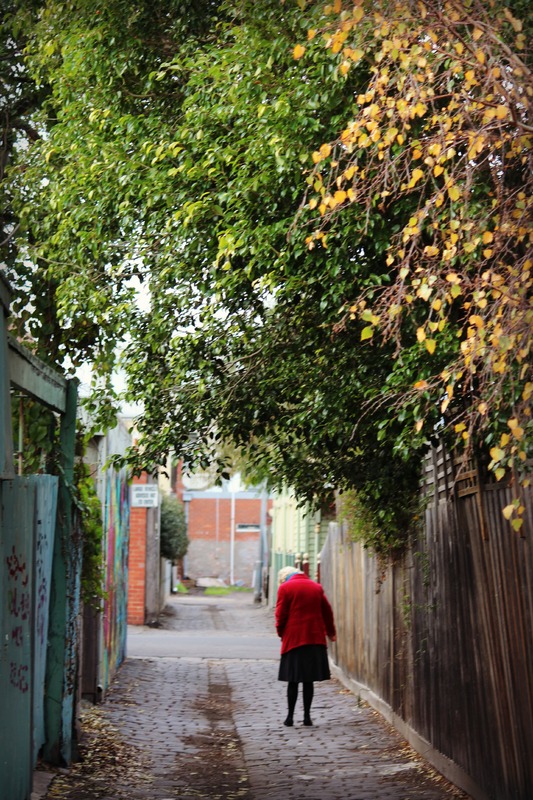 I find that in East Melbourne lots of our younger, professional clientele find coming to open for inspections after work the most convenient for them. When we do open for inspections on Saturdays, we don’t usually get the crowds of potential tenants we experience mid-week. I am all about doing open for inspections during the week and getting the property leased for the landlord before the weekend arrives. What is one unexpected thing that has come from your work in property management? I have to say that everyone you meet is a prospective client, and I’m finding at the moment my biggest referrers are my tenants! Agents often forget about tenants are simply think they’re annoying, always asking for maintenance. My philosophy is that you should treat all clients the way you’d like to be treated – you’ll never know where your next business is coming from. Classic hawthorn-brick styling on this elevated Carlton North terrace. Punters: What a blustery and oddly mild morning – the very substantial crowd is testament to Melbournian’s natural love and curiosity of the auction process. Lots of neighbours present having a chat… it did appear that there was a quite a bit of browsing at all the auctions we attended today. The feeling of the auction didn’t have that high-charged ready-to-do-business vibe. This particular home would be suitable for those wanting to renovate or extend, but we didn’t see many developers in the crowd either. Rapunzel, Rapunzel… let down your hair! 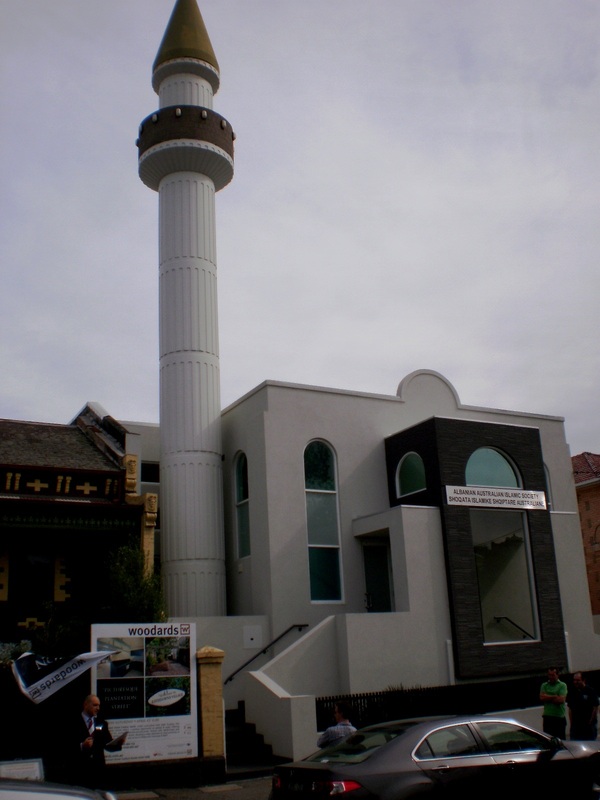 763 Drummond Street’s next-door neighbour is the Albanian Australian Islamic Society. What a tower! 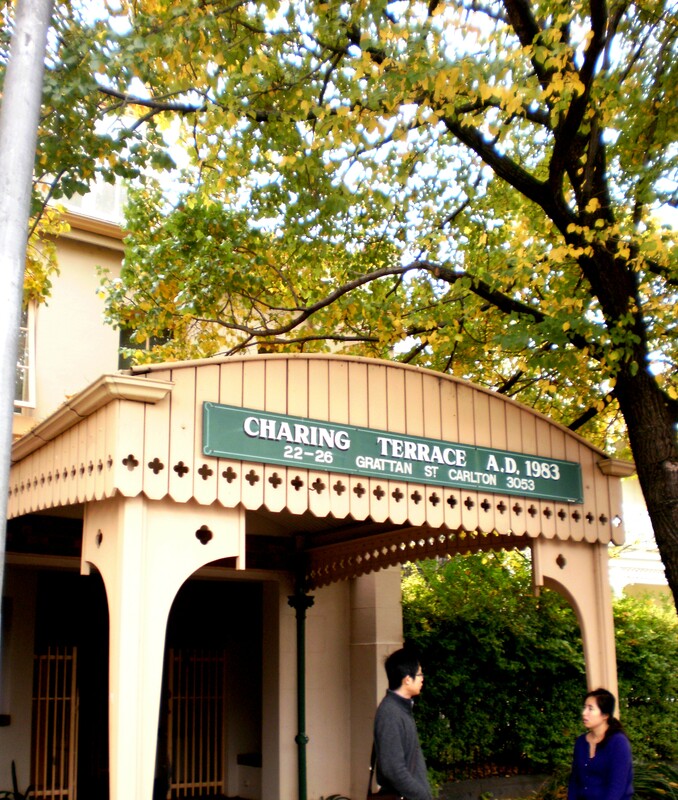 Review: 763 Drummond Street is located in a premium section of Carlton North, very close to the Rathdowne Village and other amenities. The home itself was elegantly elevated, guaranteeing any future owner years of enjoyable evenings with a cup of tea on the balcony surveying their kingdom. The interior of the home needed substantial work, but the size of the land was impressive with room for expanding the living space if necessary. The home was auctioned by Danny D’Orazio, representing the vendors who were State Trustees. Danny called a strong auction, impressing upon the crowd the benefits of the residence and its suitability for renovation. 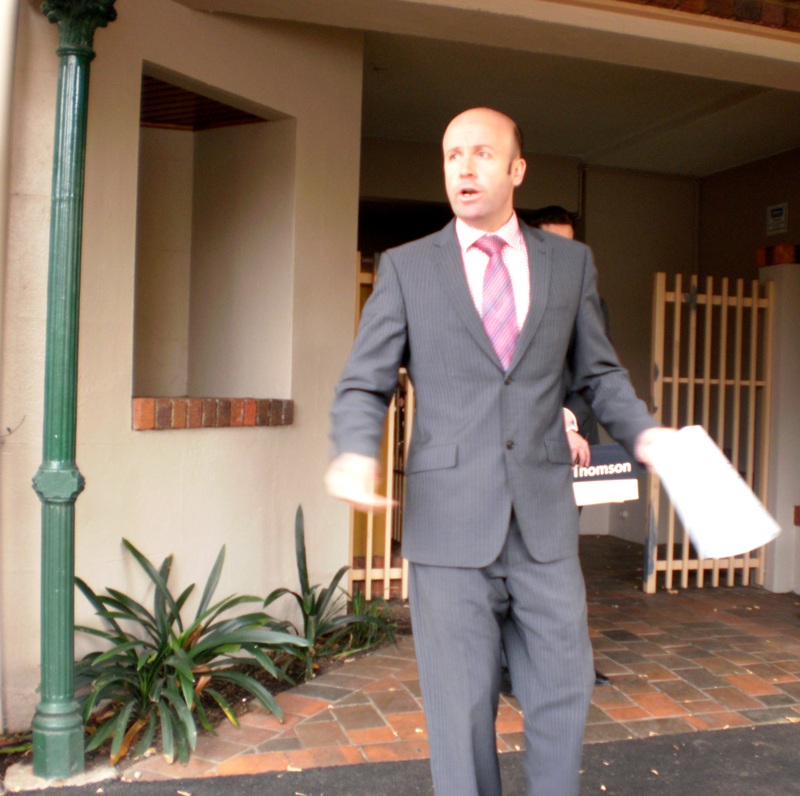 He also made it clear that a State Trustees auction meant business, and that his clients were committed to selling the property. 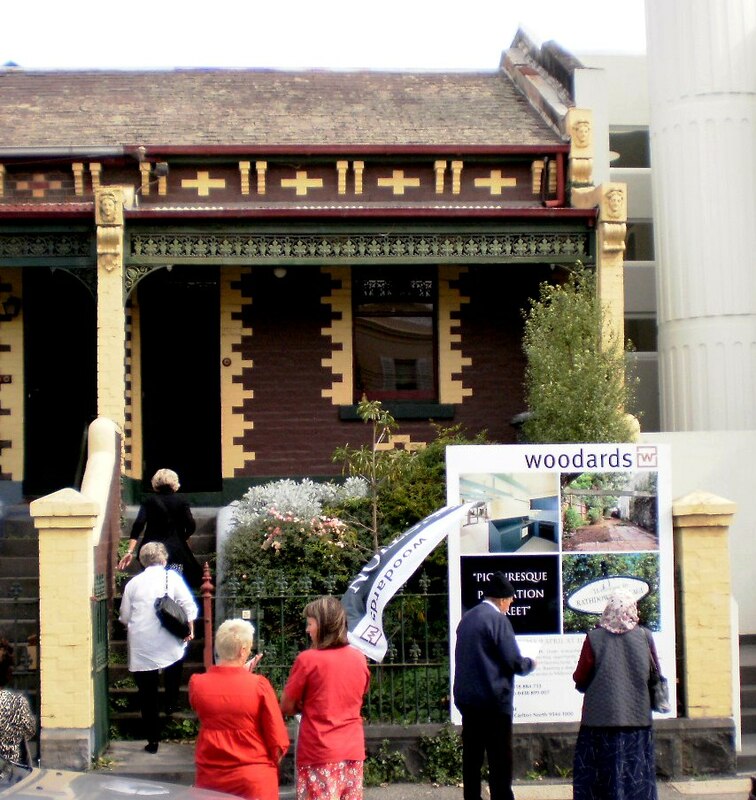 The crowd remained silent, and Danny called a vendor bid of $800,000 – noting ‘even the council would buy it for that!’. There was one natural bid from the crowd at $805,000 before Danny called a second vendor bid at $900,000 and passing the property in. We hope that this beautiful home finds an owner to restore it to its former beauty! Woodards’ Auctioneer and Listing Agent Danny D’Orazio giving a shout out to the crowd. Punters: Ryan Street is a narrow locale hidden behind the bustle of Nicholson Street, and it was looking mighty quiet at this open for inspection until 10 minutes before the auction. All of a sudden lots of prams wheeled out of nowhere and there was a good crowd of families looking for their next home! 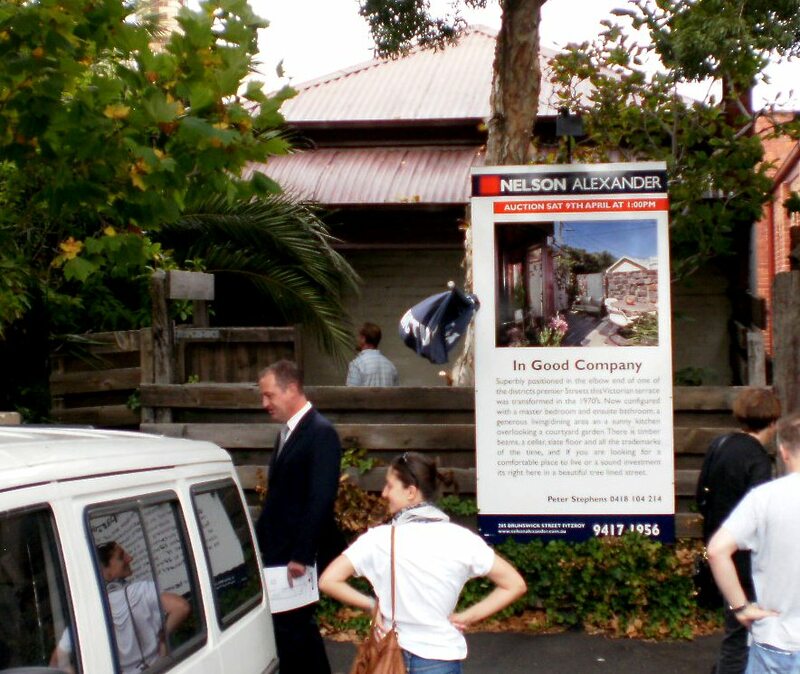 No renovators here, or newbie buyers – solid family investors were afoot. 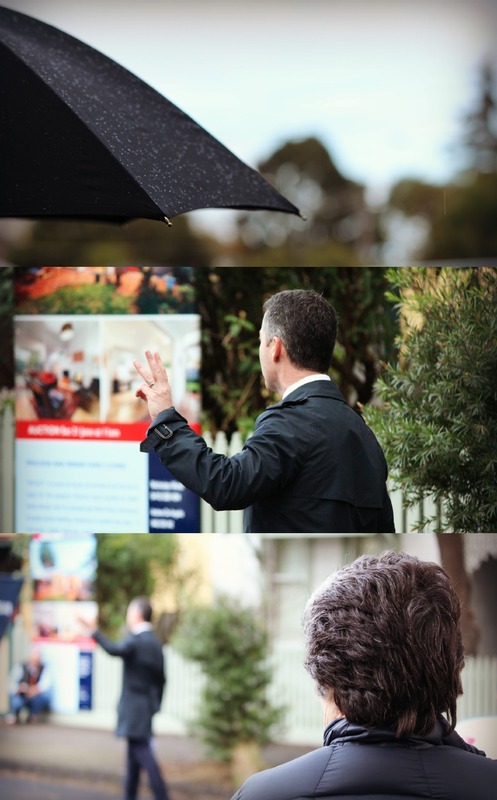 Auctioneer and listing agent Simon Shrimpton encouraging the family crowd to raise their hands. Review: I haven’t seen a house represent such good buying for a loooong time. And by ‘represent good value’, I mean that it ticks the suitability box for its key demographic – family buyers. Relatively new, this tri-level townhouse was built to a good quality and features three bedrooms, two bathrooms and a divided living area, plus parking for two. What more do you need if you want to live near the city and public transport – and all at the very reasonable quote range of $660,000 to $700,000? 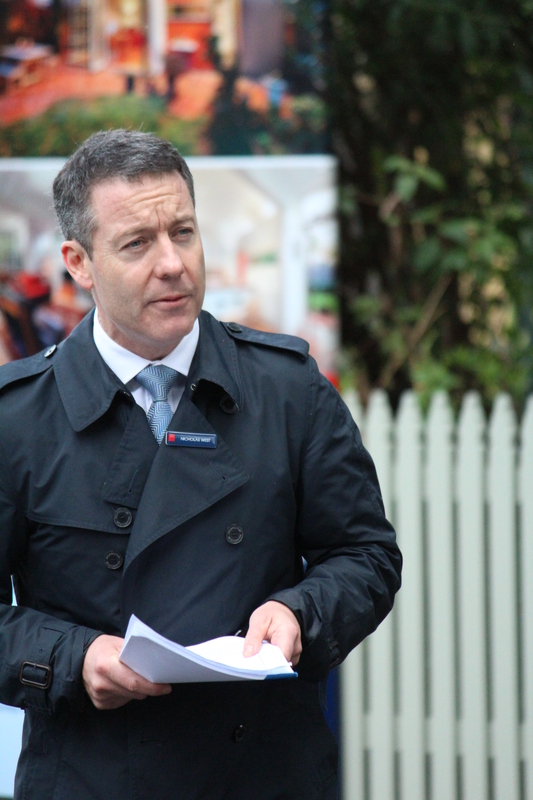 Simon Shrimpton called an engaging auction to a pretty chilly crowd – he really knew his stock and mentioned the potential rental of the property being $580 – $630 per week, also playing up the benefits of the home having no body corporate fees. Simon also mentioned a recent sale on Ivory Way (very nearby, part of the same development) which was an identical townhouse that sold for $717,500. Despite inspiring banter from the auctioneer, no bid came forth from the crowd causing Simon to call a vendor bid at $660,000. 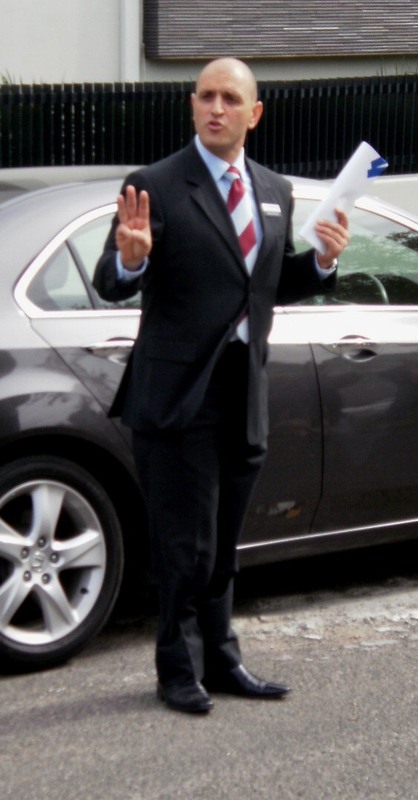 Simon then encouraged the crowd to ‘have a good think about what you are doing here today’ before making the auction rules clear regarding the benefits of being the highest bidder. The property was eventually passed in at $680,000 and is now available for private sale at $710,000. Have you got one or two kiddiliwinks? Make sure to check out this gem and move into a comfy family home – it’s just near CERES too! 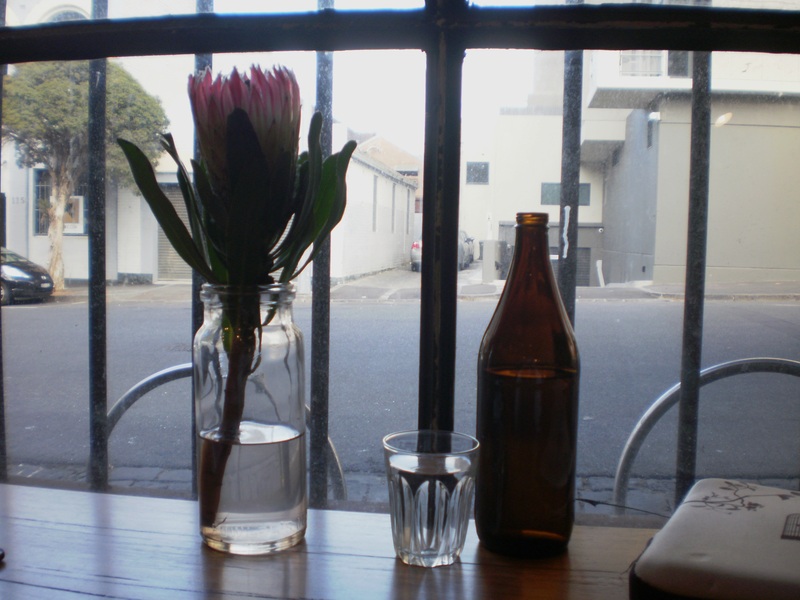 A journalist can get very thirsty on a run, so we stopped off at the quaint and very ‘Brunswicky’ Milkwood. 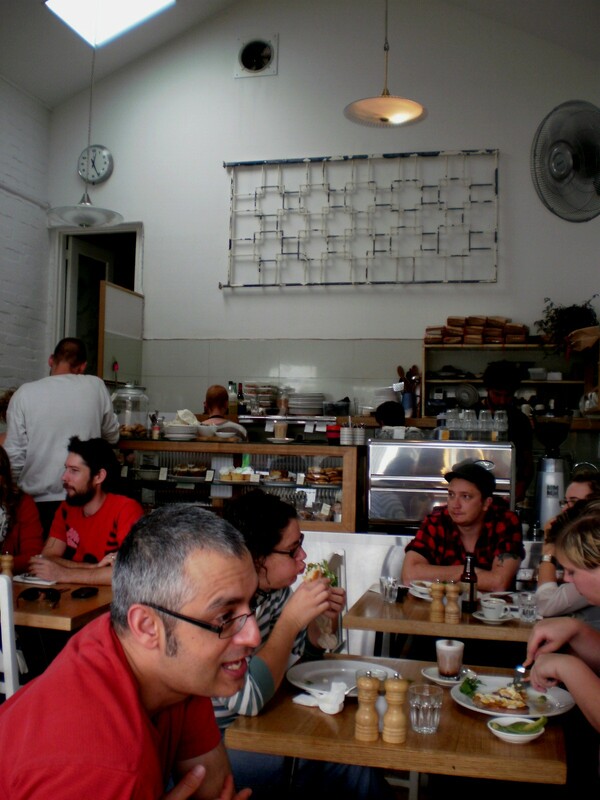 What a tiny cafe, bursting with happy afternoon munchers. We enjoyed a Phoenix organic lemonade before going on our merry way. Home Truths will plan a breakfast outing here in the future to try some of the delights on offer at Milkwood. 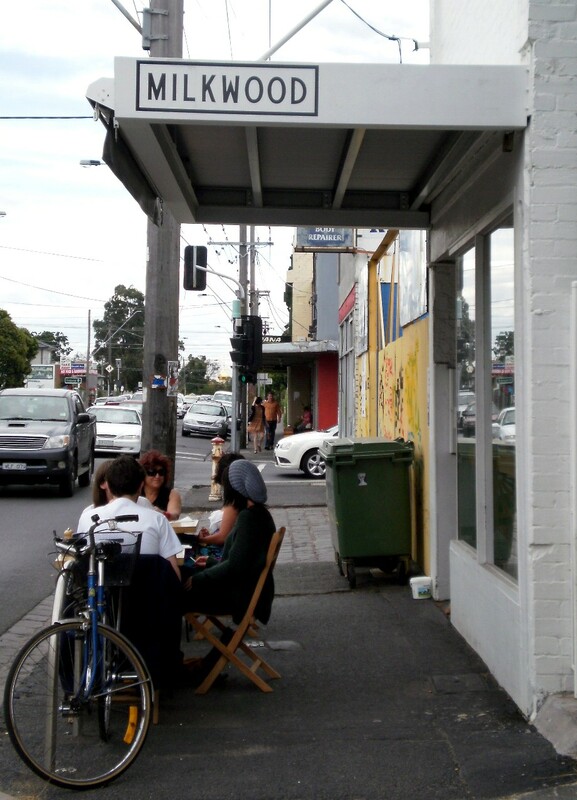 This particular part of Brunswick is really enjoying a re-birth with lots of edgy and quaint cafes and arts spaces opening up. 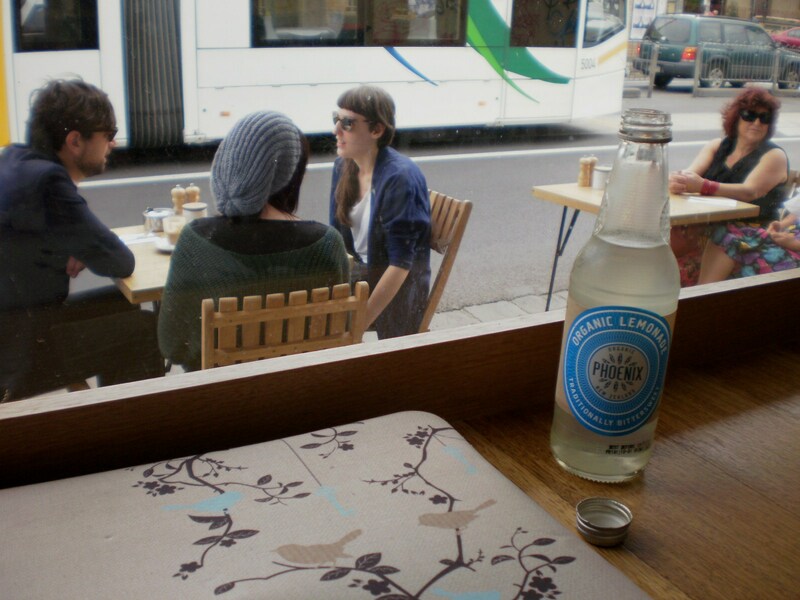 Look at that sweet white-washed interior, stocked high with treats and denizens of Brunswick. Gee, it’s almost like you’re right here with us drinking organic lemonade, friend. Punters: What a mixed bag of lollies here. The home had a mix of qualities, but had no distinct buyer demographic as such. It needed extensive internal remodelling, although it had a first-class location and some very charming internal features to enjoy. Ultimately the kind of home an investor might purchase and put a tenant into as-is (an addition to a super portfolio perhaps?) or a owner-builder might move into and do work on stage-by-stage. Probably not enough ‘meat on the bone’ for a professional developer to consider. Review: This little home was in a superb location in Fitzroy North – just around the corner from Queen’s Parade and amenities, but also located on prestigious McKean Street. Nestled amongst many imposing and grand terraces (and a church!) this little one bedroom house is the ugly duckling amongst black swans. 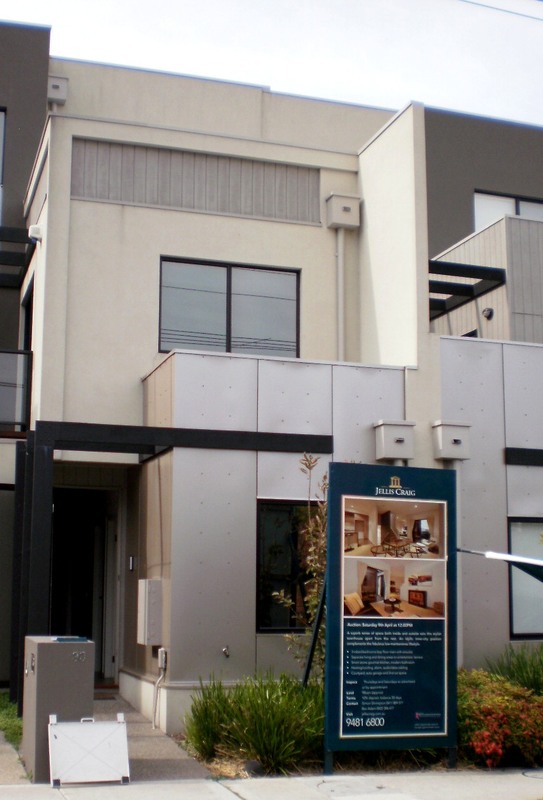 Auctioneer Arch Staver made much of this ‘ugly duckling’ factor, highlighting that buying the least attractive house on the most prestigious street was ‘investment buying 101’. The house had been strangely remodelled into a one bedroom with walk-in-robes, a generous slate-floored living room leading to a very charming kitchen (with cellar for wine, collection of John Farnham EP’s etc) and cute courtyard. Quite livable as is, but ripe for a renovation. 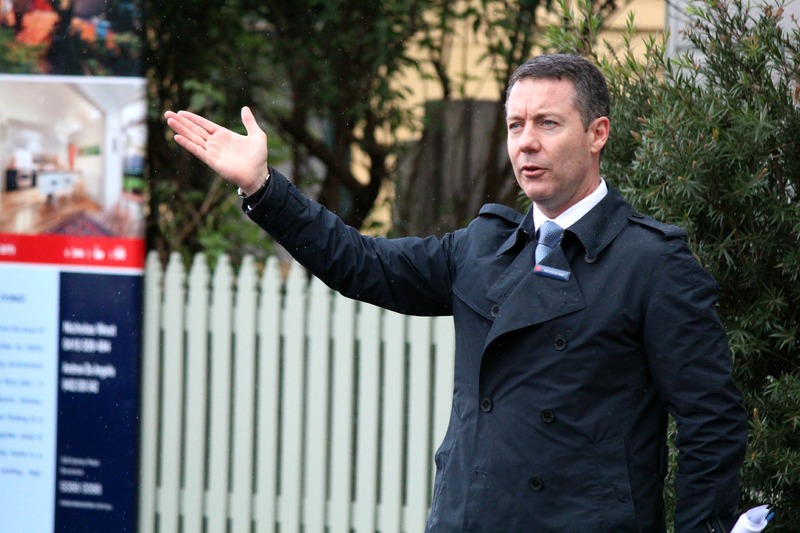 The auction punters were very cagey, with nary a hand raised in the air despite Arch’s encouragement. A vendor bid was called at $650,000 with rises requested at $10,000 a time – to no avail. The home was passed in on a vendor bid and is now available for private sale at $700,000. 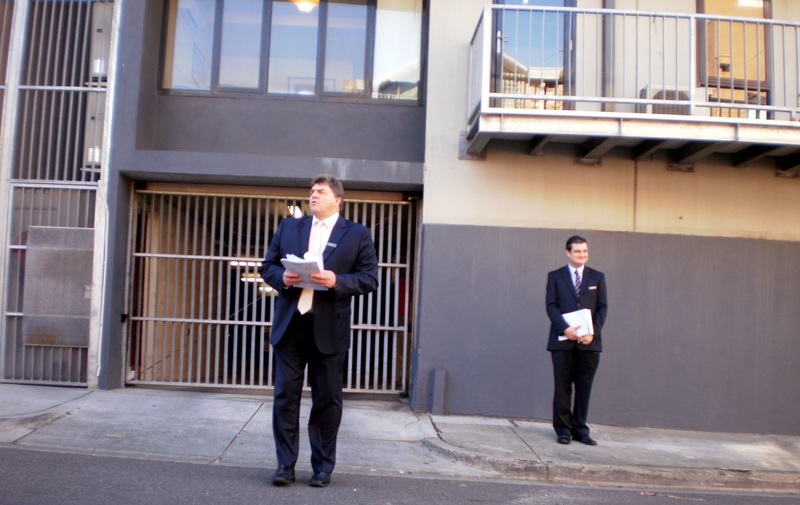 L-R: The charming listing agent Peter Stephens and Arch Staver, sharp Auctioneer. 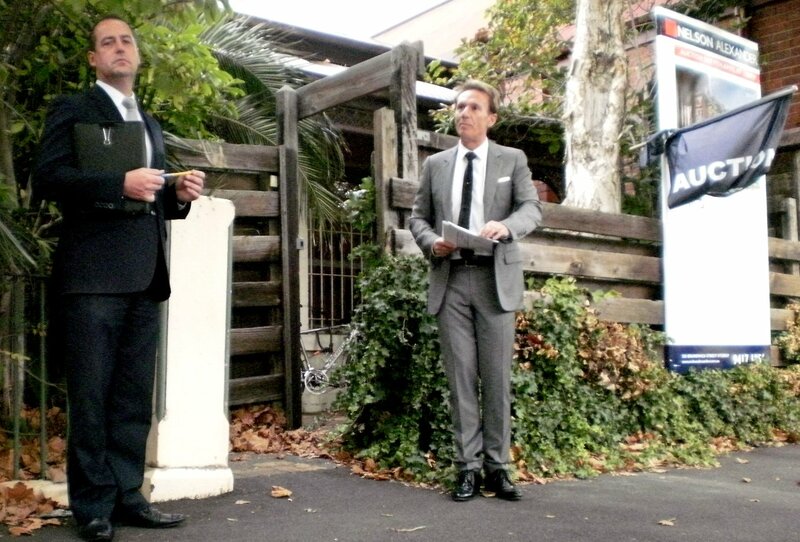 And so ends Home Truths’ journey throughout Melbourne’s auction market. We hope that you enjoyed the ride and picked up some trends from our reports. Remember – in a weekend where properties pass in, there is always a great opportunity for an intelligent buyer to negotiate a home for a fair price. Get to it! 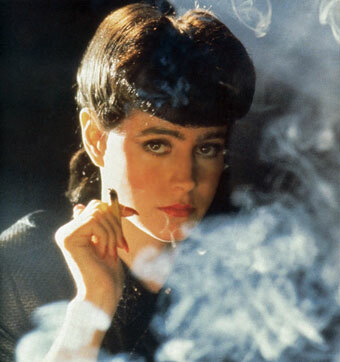 See you next week, Home Truthers!